The State Governor of Paraíba State, Ricardo Coutinho, and the general chairs of the event, Prof. Dr. Alexandre Simões and Prof. Dr. Esther Luna, launched RoboCup 2014 today, June 30th, in the Convention Center “Poeta Ronaldo Cunha Lima” in João Pessoa. Contestants from more than 45 countries and more than 60,000 visitors are expected to attend the event. 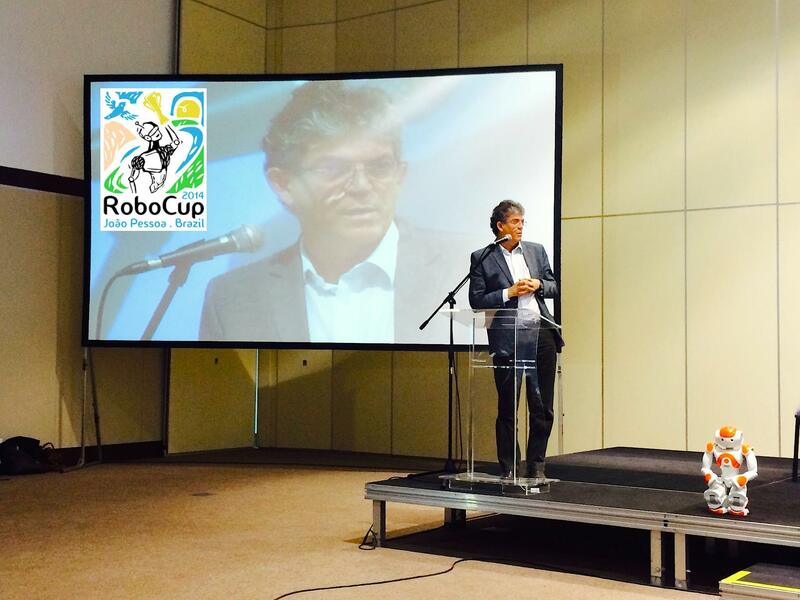 For Governor Ricardo Coutinho, RoboCup will benefit various sectors including tourism and education. “We are aware that we will need to show our organization and efficiency for the diverse and large audience that will be here in next weeks. People who will be here will carry to their countries valuable references from our region, and this is an important aspect to the development of our tourism”, he said. “This event will also bring to our country a number of good and important possibilities, due to its impact on education”, he added. Prof. Dr. Alexandre da Silva Simões, one of the three General Chairs of the event, pointed out that the choice of Paraíba to host this important event was due to two main reasons: the full support of the Paraíba State Government and the adequate infrastructure to host the event. “RoboCup has a number of very specific technical needs, and it is impossible to organize this event without attending all these technical requirements. We visited many places around the country, and we were fortunate to find the Paraíba Convention Centre, which brought together all the technical conditions for hosting the event and the international tourists worldwide”, he said. 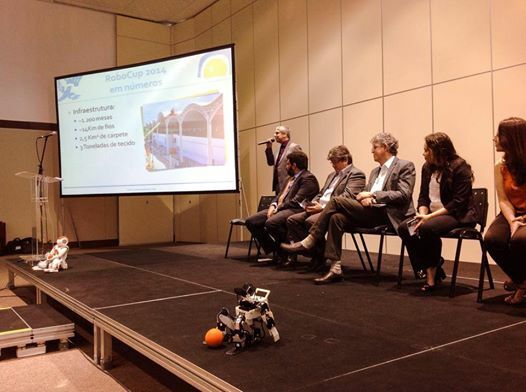 Prof. Dr. Esther Luna Colombini, also General Chair of the event and vice-coordinator of the Brazilian Robotics Olympiad (OBR) highlighted the participation of Paraíba State in the Olympiad, that is the “national phase” of the international RoboCup. “Brazilian northeast represents today about 40% of the total numbers of the Olympiad. We were proud to see that in 2014 Paraíba was the state with the second highest number of participants around the country. São Paulo is the only state that still exceeds the number of participants from Paraíba. However, João Pessoa, capital of Paraíba state, is the Brazilian city with the highest amount of teams, even higher than São Paulo city. 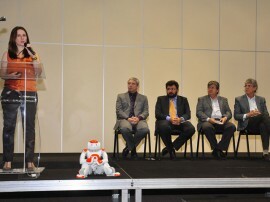 This is a legacy of RoboCup in João Pessoa, as well as a legacy of the public policies to foster education”, she said. 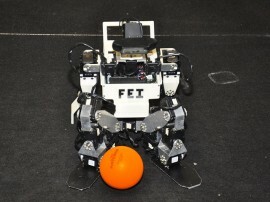 The Brazilian Robotics Olympiad is expected to reach about 100,000 students in 2014. 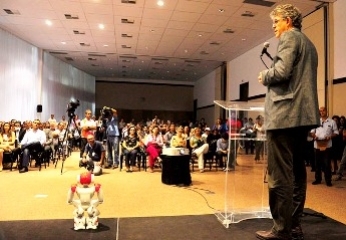 RoboCup 2014 is supported by the Paraíba State Government, Brazilian Sport Ministry, Brazilian Computing Society and a high number of Brazilian and worldwide universities. 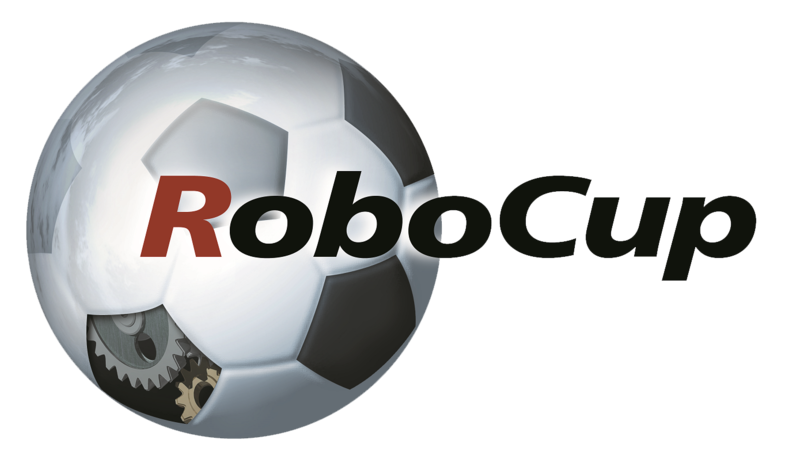 The competition is organized worldwide by RoboCup Federation, institution analogous to FIFA in the robots soccer universe. The launching ceremony also has the participation of a number of State Government authorities, such as the executive secretary of the State Science and Technology, Francilene Procopio, the Paraíba Science and Technology Secretary, João Azevêdo Lins Filho, the president of the Paraíba research agency (FAPESQ), Claudio Furtado, and the rector of the Paraíba Federal University (UFPB), Margareth de Fátima Formiga Melo Diniz. Professor Alexandre also presented some numbers of the production phase of the event. “We expect to build about 1,200 tables to attend the contestants. If these tables were positioned in a line over the main city avenue, the Epitácio Pessoa Avenue, they would cover a distance from the beach until the Ruy Carneiro Avenue. We would have more than 6Km of tables”, he said. “We also expect to install more than 14Km of electrical and network cables in the Convention Center. These cables would be enough to cover all the Cabo Branco beach twice, from the Science Station until the Tambaú Hotel”, said Simões. The organizing committee also expects to install in the Convention Center “Poeta Ronaldo Cunha Lima” more than 3 tonnes of tissue and to construct two houses with 100m2 each where robots are expected to assist people in home activities, as well as more than 50 robot soccer fields and arenas. 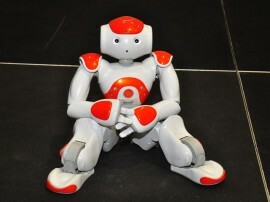 THe launching ceremony also counted with a humanoid robot dancing performance, organized by Arthur Mainardi Jr. from Grupo Somai, and a official kick off by a humanoid robot from FEI university.